This Master of Science in Public Health Management is an excellent program conducted by JLI in collaboration with the International Telematic University UNINETTUNO, Rome, Italy. In this dual degree program you earn an Advanced PG Diploma from JLI and then upgrade it to a full MPH degree from the International Telematic University. If you have the zeal to make a meaningful difference in the world we live in, opting for a Masters in Public Health degree (MPH) could be very rewarding. If you hold a commitment to improve the health of people around you, you will discover that studying public health can lead to a range of fulfilling and far-reaching careers. The Master of Science in Public Health Management (MPH) course is an online taught program conducted by James Lind Institute (JLI) in collaboration with the International Telematic University, UNINETTUNO, Rome, Italy (Università Telematica Internazionale UniNettuno 'UTIU'). This is a dual degree program conducted in two stages. 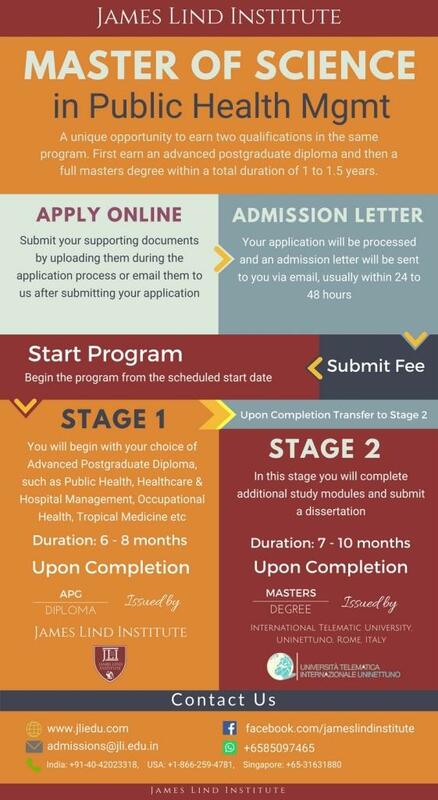 In the first stage you earn an advanced postgraduate diploma in any of the health specialities like public health research, maternal and child health, tropical medicine, global health, occupational health, environmental health, healthcare management or clinical research. The second stage is the master’s level in public health and includes a dissertation. Public health is taught at James Lind Institute with an international overview, focusing on the various career pathways in which public health professionals have become indispensable worldwide. Public health professionals often work at national and international levels, as public health leaders and researchers and are key players in developing epidemiological strategies and methods to prevent disease, develop social reforms, and promote health and well-being. A Masters in Public Health degree (MPH) opens up the gateway towards a successful career in the exciting field of Public Health. Pathway to earning a Master of Science in Public Health Management (MPH) involves 2 stages. Upon enrollment in this program students will be given a choice to complete any Advanced Postgraduate Diploma from the James Lind Institute. Choosing an Advanced PG Diploma from the healthcare category e.g. Advanced PG Diploma in Healthcare & Hospital Management; Advanced PG Diploma in Tropical Medicine, Surveillance & Immunization; or Advanced PG Diploma in Public Health Research etc. is preferred but not mandatory. Upon completion of Stage 1 the student will be transferred to the International Telematic University UNINETTUNO, Rome, Italy for pursuing the online Master of Science in Public Health Management (MPH). Up to the Advanced PG Diploma level the study procedure will involve completion of study modules in James Lind Institute's e-Campus that contain audio visual content, interactive documents, videos, podcasts and other multi-media content as may be applicable. A demo of the study materials is available in the elearning section of this website. In masters level i.e. Stage 2, the university's online learning methodology is followed. The university conducts the online training within the WEB macro-area known as the Didactic Cyberspace. In this area students can access digitized study materials, interact with a guide (professor-tutor) and also access virtual classrooms and a 3D Auditorium where students and professors-tutors interact in the three-dimensional world of UNINETTUNO via voice. How will I receive certificates? Upon completion of the Stage 1, James Lind Institute will issue the Diploma and Transcript within 2 weeks. These are required for progressing to Stage 2 i.e. masters level. The soft copies will be sent to the student via email as soon as available and the originals will be sent via post/courier. The University offers to students the optional opportunity to facilitate them in order to spend part of their studies, when they draft their research dissertation project, as interns in a European Union member state. The Internship Program is coordinated by the Organisation Atheneum Liberal Studies..